Longboarding, also known as skateboarding is a fun activity of riding on a longboard deck. From adults to teens, everybody is getting into this exciting sport and making it a point to do whenever they get free time. 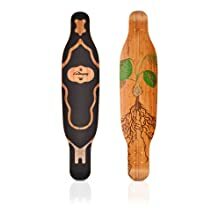 If you are also inclined to enjoy longboarding just like your friends, you first need to choose the best longboard deck to experience a smooth ride. 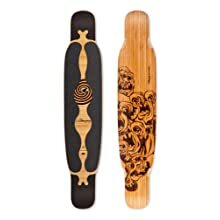 Being an expert in this sport, I will guide you how to pick a right longboard deck that will fit your needs and save your time plus money. Longboard deck is basically a long, flat board used to stand on while skateboarding. Typically, longboard decks come in lengths ranging from 33” to 60”. They are different from regular skateboards due to their unique shape and length range. Longboards are great for enjoying diverse styles of skateboarding including freestyle, cruising, downhill, slalom and carving. Apart from fun, longboards can also be used for quick short distance travelling. When it comes to choosing a right longboard deck, certain characteristics such as shape, length, width, material and built must be considered. Also, consider the style of longboarding you’re planning to adopt. I’ve mentioned some important factors to help you figure out what you need. If you are looking for a longboard for regular trips to school or to the shopping malls, you will need one in a smaller size. It will make cruising easier by allowing you to navigate through the busy sidewalks without hurting pedestrians. But if you’re inclined to try some hills, a longboard with enhanced stability will do great and can also be used for simple cruising/carving. Not so long longboards ranging from 28” to 32” are perfect for young riders who are beginners, small in height and not so confident in longboarding. Short cruising decks can also be used by tall riders who are quite assertive of their boarding abilities and know how to switch between different longboarding styles. When you are so much confused about where to start, it’s always safe to go with mid-sized longboards ranging from 32” to 42”. Due to their medium size, they are perfect and comfortable to attempt any style of longboarding. Longboards in this range are highly recommended for street cruising and widely used by amateurs for regular short trips. Long cruising decks are quite convenient for covering longer distances smoothly. With these boards, you can enjoy relaxed rides on the sidewalks and practice advanced skateboarding styles on flat surfaces. Longer cruising decks are perfect for expert riders who can handle the heftiness without losing their balance. Keep one thing in mind, these boards can be much heavy! Decks with the shape of twin-tip make the longboards far easier to ride for anyone and also provide an exotically aesthetic look to the boards. But that clearly doesn’t mean that people with longboarding craze will not prefer using a kicktail when given the opportunity. Deck with a kicktail is perfect plus convenient to attempt interesting tricks, take quick turns and pop up and down curbs. It’s totally up to beginnersif they want to pick decks with or without kicktails. If you find yourself comfortable with kicktail and capable of using it righty, simply go for it. If you’re into attempting the thrilling, kicktail maneuvers just get somethingelse as there are a lot of deck options to fit your preferences. No-kicktail longboards are highly recommended for beginners because they maximize the effective wheelbase resulting in enhanced stability. Although there are many exciting longboarding styles, freeride is widely practiced and highly enjoyed by all riders.When it comes to choosing a right deck style for freeride, beginners may go with drop-platform whereas intermediates must consider drop-throughdecks. Also, choose an appropriate deck dimension that lies somewhere between 38” and 42”. Some deck styles are considered to be ideal for freeride, although you can go with any deck. Where downhill decks are much longer than the average board and totally rigid flexible boards are suitable for parking lot fun instead of down steep roads. Considering the opinions of experienced longboarding riders, drop-platform and drop-through deck styles are the best options suitable for freeride discipline. Drop-through decks are quite easy to manufacture than drop-platform decks hence they are more common. With drop-platform and double-drop decks, beginners can enjoy the freeride style flawlessly. Drop platform decks come with lowest platform that makes longboarding quite easier for learners who are still practicing balance and taking baby attempts of slides. With enhanced stability, beginners become able to practice tricks and quick turns with drop-platform decks. Lighter and slimmer, drop-through decks are no doubt perfect for people who want to attempt flip tricks and carry boards as a style statement. Due to its slimmer construction, drop-through deck doesn’t weigh much and can be carried easily. But make sure you select a drop-through deck with little flex because flex doesn’t support freeride discipline and creates disturbance. For freeride style, you need decks in the length range of 38” to 42”. Any shorter and you won’t be able to maintain the balance while with longer decks, you will feel so uncomfortable and won’t be able to enjoy a smooth ride. As far width is concerned, it correlates with the length hence not much significant. Drop-platform and drop-through decks with width range of 8.5” to 10.5” are commonly used for freeride hence anything in this range will do great. Just like freestyle, downhill is also a longboarding style that requires a little training and suitable deck. For this style, beginners are highly recommended to use drop-through decks whereas intermediate riders will find top-mount far comfortable. As board’s length is quite significant for smooth rides, decks ranging from 37” to 43” are ideal for high speed downhill. Any deck can be used for downhill longboarding but if you want to do it flawlessly without facing any problems, a few deck styles are ideal. For years, I’ve been down-hilling at South California mountain roads and from my experience, the drop-through and top-mount decks are surely the best to go with. Where drop-through decks offer enhanced stability and widely used by legendary longboard racers, nowadays, youngsters find top-mount decks pretty efficient to wind the road down in a crack. Being a beginner, if you face problem in maintaining a balance or speeding up, with drop-through deck you can now enjoy a flawless ride with higher stability. As they are designed lower to the ground, riders find them more stable and do not fear to attempt speedy rides. The plus point is that drop-through longboards can also be used as top-mount decks with a little practice. When it comes to choosing the best deck for beginners to attempt downhill, drop-through is the only perfect option! Unlike drop-through decks, top-mount decks have tricks directly attached to the bottom of the longboard. This feature provides better grip to the riders allowing them to bend and turn pretty easily. Tuning of top-mount decks is necessary to experience stability at high speed. For downhill style, top-mount decks enable better performance allowing riders to slow down while sliding through the tight corners. However, great skills are required to explore the potentials of a top-mount deck and if you’re a passionate plus experienced rider, this deck style is ideal for you! For downhill style, decks with lengths ranging from 37” to 43” are perfectly fine. Shorter than this length will lead to high speed stability issues whereas longer deck will make it difficult for riders to attempt downhill drills. For beginners, longer decks are recommended, ranging from 40” to 41”, until they learn to maintain balance during high speeds. Width for downhill deck is not as significant as length because it varies according to the length ranges. Commonly, width ranging from 9” to 10.5” is fine for downhill. If you’re wearing bigger shoes, wider deck would do great and if smaller, go with something thinner one. 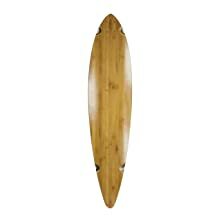 This 48.5” long and 9.5” wide longboard deck is probably the best dancer you may find on the market. It has two vertical cores, both made up of vert-lam bamboo. Although there are little paint imperfections, the functioning is perfectly fine. With the truck size of 180mm and 70mm or smaller wheels, this deck is truly light in weight and ideal for freestyle longboarding. Good flex and plenty of space make it pretty easy to enjoy some groovy movements! This board leaves it all up to you whether you want to use it for cruising, freestyle or downhill. All you got to do is to pair it with right trucks and wheels and you’re good to go. Considering its width, it’s ideal for riders with big feet and provides stability. Moreover, it comes with a grip tape that just makes it even better for a stable ride. From shape to weight to curves, everything is good enough to let you enjoy some fun moves while longboarding. Whether you want to do some tricks or enjoy street cruising, this board is going to serve you well by all means. With the length of 40”, this long longboard is made up of a fine blend of bamboo and maple to ensure durability and good flex. From fun cruising to everyday commuting, this deck is perfectly fine to go with. You can also use it for downhill longboarding style because of its good flex and stiffness. 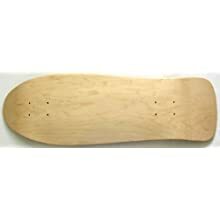 People with craze of attempting longboarding maneuvers must consider buying it because of its super sturdy design. Moreover, it works perfectly fine with heavy trucks and wide wheels to provide enhanced stability. Here comes this vertically laminated bamboo longboard deck with the length of 38” and flex 2. It’s a top-notch quality deck that will allow you to go with any longboarding style, from cruising to carving to freestyle. The brand Loaded makes decks with different flex. Where flex 1 offers stiffness, flex 3 provides extreme flexibility. If you’re not so sure to go with any of these, flex 2 is the safest option. This deck features quite a wide and refined platform with two truck options. 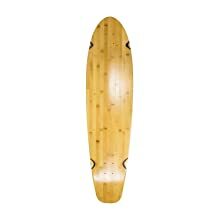 This last longboard deck on our list is a bamboo deck with the dimension of 44” X 10” and pintail feature. Apart from its artistic design, this deck is perfect for cruising and with a little tuning; you can also use it for downhill style. It’s flexy, durable and lightweight which means, this piece is just right to do some tricks and enjoy groovy movements. This high quality deck is finely finished and also supports painting and stickers pretty well so you may add some personalization to it. Longboarding is truly a fun activity that also brings flexibility into your body and keeps you healthy. To enjoy this sport at fullest, you first need to get your hands on a right longboard deck that must be supportive of your style and status. Decks that work well for advanced and intermediate riders might not turn out to be good choices for beginners. Moreover, in addition to the styling of a deck, its dimension also plays a vital role to support a certain longboarding style such as freestyle and downhill. Make sure, you check the style and dimension of the decks before purchasing one.